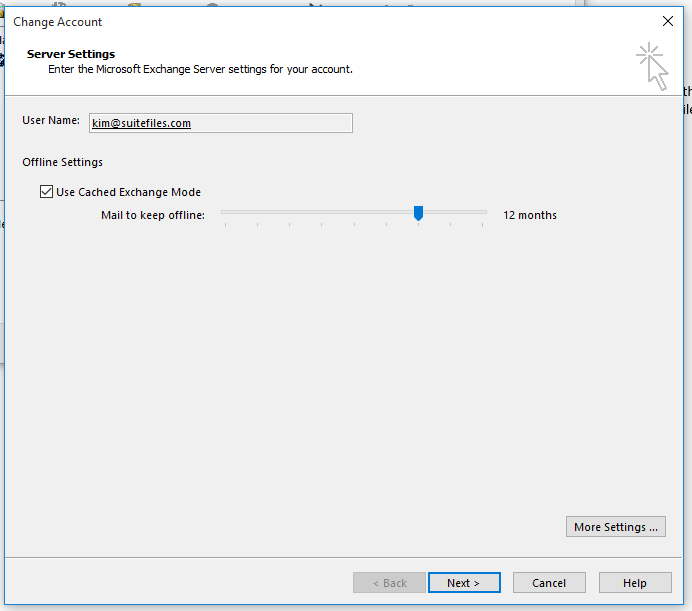 If you can't save an email from Outlook into the SuiteFiles plug-in, it might be because your Outlook cache limit is set for a certain period of time. Outlook caches or saves a version of every email in Outlook to both your desktop (offline) and the cloud. To reduce the amount of emails that have to update between your desktop and the cloud, Outlook will often set your cache limit to a certain period of time, typically 12 months. For any emails older than that, Outlook does not save a .msg file for that email on your desktop and only shows a view of it. SuiteFiles Outlook saves the .msg file. Go to File -> Account Settings -> Account Settings again. A pop-up window should appear - double click on your email address. Drag the slider for 'Mail to keep offline' all the way to the right, to 'All'. Once you've done this, Outlook will automatically cache all your emails again on your desktop. You should then be able to drag and save emails in the Outlook plug-in.